Rena18 and Dublin ending their All-Ireland wait both feature. 2017 IS A year which won’t be forgotten anytime soon on the Ladies football and camogie scenes. From big wins across the board in terms of record attendances, viewing figures and a notable shift in overall interest to inspiring team and individual performances, highs and lows; it had it all. The Ladies football All-Ireland finals day attendance record was shattered on 24 September as a total of 46,286 people turned out to Croke Park. It marked an increase of almost 12,000 compared to the number of people at the 2016 decider. The Armagh star lit up Nowlan Park with an expceptional goal back in August, and everything about was top class — the ball in from Caroline O’Hanlon, the turn, the perfect finish. The Mayo legend signed a professional contract with Australian Football League Women’s (AFLW) side Greater Western Sydney Giants in October. After guiding her club Carnacon to a sixth All-Ireland senior title on the first Sunday in December, she left for Sydney to begin the next chapter. The AFLW kicks off at the end of January. Seven-in-a-row chasing Cork were eyeing their 12th All-Ireland title in 13 years, but they faced a semi-final exit in this year’s championship. Staunton collected 1-9 on the day at Kingspan Breffni Park as Mayo made up for last year’s one-point semi-final defeat to Dublin at the same venue — and they reached a first All-Ireland final in 10 years. Fourth time lucky. The All-Ireland senior final between Dublin and Mayo had it all, but it ultimately ended in Sky Blues captain Sinéad Aherne lifting the Brendan Martin Cup. Hurt from one point losses in 2014 and 2016, and a two-point defeat in 2015, all to Cork was finally put to bed as they ran out 12-point winners. Two goals from substitute Sarah McCaffrey, and one each from Niamh McEvoy and Carla Rowe led them to All-Ireland senior glory for just the second time ever. The Premier county capped a remarkable 2017 as they were crowned All-Ireland intermediate champions in September. Aisling McCarthy was the star of the show as they ran out three-point winners over Tyrone in the Croke Park showdown. They added the Mary Quinn Memorial Cup to their Munster title and Division 3 Lidl Ladies National League crown. 15 games, 15 wins and three titles. A year to remember, finished in style. As Sarah McCaffrey palmed the ball into the Hill 16 goal to put the cherry on top of Dublin’s emphatic All-Ireland final win, the cameras turned to her brother. It’s fair to say that 2015 Footballer of the Year Jack McCaffrey was one of the happiest men in Croke Park as Dublin finally had their day in the sun. Sarah’s two goals from the bench ensured that two All-Ireland medals went home to the McCaffrey house in Clontarf within one week. There were just 48 seconds left on the clock when Fermanagh’s Sharon Murphy stepped up to take a crucial penalty in the All-Ireland junior final. Three points down, she showed nerves of steel to slot the ball into the top corner of the canal end goal and send the clash with Derry to a replay. The Ernesiders won on second asking. The morning after the All-Ireland final, the winning team always visit Our Lady’s Hospital in Crumlin and Temple Street Children’s Hospital. But this year, beaten finalists Mayo also made an appearance. It was likely made all the more emotional by the fact that Frank Browne lost his six-month-old daughter Emma to pneumonia in 2003. “A team will go into Crumlin or into Our Lady’s and that’s where real tragedy and real devastation is going to take place, not out here on the field of dreams,” he told The42 in the days leading up to the final. The scheduling raised eyebrows, with the Limerick county board coming under serious fire for the bizarre throw-in time. But before the clock struck 10.30am on the day, Gerald Griffins had played a hard-fought 60 minutes of football to win a county championship title. They beat Groody Gaels in the junior ladies decider in Knockainey. 16-year-old O’Donoghue took Nowlan Park by storm back in August, producing a sparkling senior debut as Kerry booked their All-Ireland football semi-final spot. An underage soccer international with Ireland, O’Donoghue bagged an impressive 1-4 from play and truly caught the eye for the Kingdom, making a name for herself on the inter-county scene in doing so. At first glance of the programme, it was a very different Cork side to that whom had done the honours the previous year. No Breige Corkery, no Rena Buckley, nor Ciara or Roisin O’Sullivan who were both travelling. Deirdre O’Reilly had retired and to make matters even worse, 2016 Footballer of the Year Bríd Stack was withdrawn from the starting side before throw-in due to injury. But they did it. 22-year-old Doireann O’Sullivan captained the young guns — their oldest starting player was 27 and next in line, 25 — to their fifth title in-a-row, edging past Donegal. 2017 saw the east Cork side claim their first county, provincial and All-Ireland titles, and there were serious scenes after they lifted the national title. As captain Emma Farmer finished her speech after accepting the trophy, there was one last thing to do. Hannah Looney took over the microphone for a quick rendition of Caledonia. “Aghada you’re calling me now I’m going home,” they finished. Shortly after, Looney’s interview with Jerome Quinn for the LGFA was hijacked by a delighted supporter who works with her aunt in the club shop. The inter-county year ended on a high at the Citywest Hotel in late November, with star players rewarded for their remarkable efforts. Among the interesting wins on the 2017 All-Star team were two sisters — Donegal’s Niamh and Ciara Hegarty — and Kerry midfielder Lorraine Scanlon, who won the accolade exactly 30 years after her mother Mary. A few extra special family moments. On 10 September, Cork dual star Rena Buckley made Gaelic Games history as she won an 18th All-Ireland medal. She captained the county camogie side to glory and climbed the steps of the Hogan Stand to lift the O’Duffy Cup following a dramatic one-point win over Kilkenny. Buckley previously had 17 medals across both codes, an honour which she shared with Briege Corkery but with Briege taking a break from the inter-county scene for the year, Rena went one up. Back in August, Cork dual player Libby Coppinger faced a dilemma and the controversy came to the fore of the media. The All-Ireland senior football quarter-final against Galway at 12.30pm was fixed for Cusack Park, Mullingar, before the camogie side faced the Tribeswomen in the national semi-final in Limerick at 7pm. Both games were set to be broadcast live by TG4 and RTÉ respectively, and for that reason, no alternative arrangements could be made — as per both associations. Coppinger focused exclusively on camogie in the end, released for the day by football manager Ephie Fitzgerald. Wexford legend Kate Kelly retired from inter-county camogie in June. After a remarkable 21 years of unbroken service to her senior inter-county set-up, Kelly ended a glittering career with four All-Ireland senior titles, and an impressive nine All-Star accolades. She wasn’t supposed to play. After sustaining knee ligament damage in the semi-final, she was completely ruled out of the decider. But there she was, fully togged in the warm-up in her number six jersey. She started, and played well. And then came the pinnacle. Trailing by a point, O’Connor stepped up and nailed a monstrous, long-range effort to tie matters before substitute Julia White added the winning score. David Herity’s Dublin booked their place in the All-Ireland semi-finals for the first time since 1990, as they overcame a much-fancied Wexford side in August. ’27 years of history gone anyway!’ the former Kilkenny goalkeeper grinned that day in Semple Stadium. They were knocked out by the Cats, the then-reigning champions, in the semi-final but competed well, paving the way for a bright future. The premier junior team also reached the All-Ireland junior final while the U16s and minors enjoyed successful campaigns too. 2017 saw a huge piece of history written in camogie. Two teams made up of the country’s top players are headed for Madrid on the first-ever Liberty Insurance Camogie All-Star tour. While in the Spanish capital, the 2016 and 2017 All-Star teams, along with several nominees — made up of players from eight different counties– faced off in an exhibition match. It was a first visit to Croke Park for the Westmeath camógs, and they left with the cream — their first All-Ireland title. The Kathleen Mills Cup spends the winter in the Lake County for the very first time after they saw off Dublin by four points in the premier junior final. And the raw emotion from players after the game showed truly how much this meant. Cork and Galway played out a thrilling All-Ireland semi-final at the Gaelic Grounds with the eventual All-Ireland champions progressing after a three-point win. Heartbreak yet again for Galway. So close to the final but yet so far. Aoife Donohue was immense on the day in the maroon jersey and was understandably upset as the final whistle sounded. Cork star Thompson went straight to comfort Donohue with a few words and a hug afterwards, holding off her own celebrations for some time. A class act. The month of October was a hectic one for Iniscarra. The back-to-back Cork camogie champions, whom Rena Buckley plays for, were knocked out of the Munster senior club championship on 29 October, less than 24 hours after their county final win. Source: Inniscara Camogie Club Facebook. The previous Saturday, they won the county quarter-final replay and were victorious in the semi-final on the Wednesday evening. Slaughneil were crowned All-Ireland senior club camogie champions in Croke Park way back in March, and it was an emotional victory for the Derry kingpins. ‘Ní neart go cur le chéile,’ were the last words uttered by captain Aoife Ní Chaiside in her speech. Undoubtedly, she was thinking of her late father Thomas, joint manager who passed away earlier in their campaign after a long battle with cancer. He was a huge part of the club and his three daughters were involved in that win. Email “Highs and lows! The most memorable moments of the Ladies football and camogie year”. Feedback on “Highs and lows! 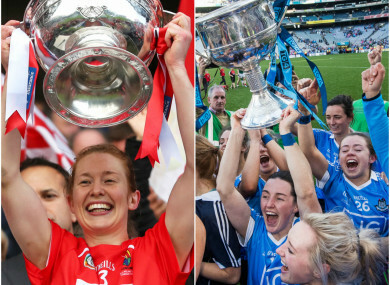 The most memorable moments of the Ladies football and camogie year”.